Lifelong sailors and racers who always dreamed of extensive cruising, we married two and half years ago and are finally doing it together. We both grew up in sailing families, Annie sailing the Florida Keys and Bahamas, and Eric sailing the Great Lakes. 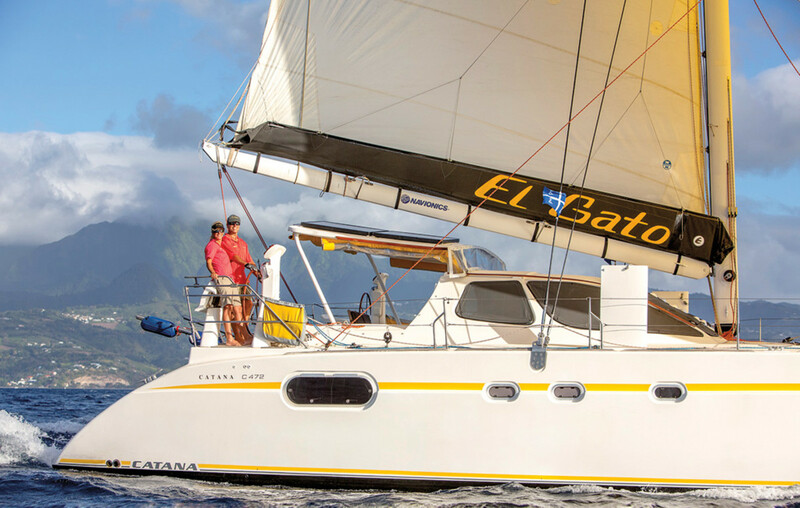 We currently own a house in San Diego but live full-time aboard El Gato, our gently used 2000 Catana 472 that we bought in France. As far as choosing the right boat for us, it took extensive research until we narrowed our choices down to the boats that met our needs. Specifically, we wanted daggerboards for performance, galley up (who wants to be below while everyone else is enjoying fresh air?) and AC. We ended up with a Catana, based on the company’s reputation for building solid bluewater performance cruisers. We are both extremely happy with our decision and have never looked back. After buying El Gato, we cruised the Mediterranean and island-hopped as far eastward as the Cyclades, before heading to Gibraltar. From there we sailed to the Canary Islands, entered the ARC+, raced to the Cape Verde Islands and then on to St. Lucia. We were the fourth boat to finish only hours behind much larger yachts. It was a thrill ride that lasted 10 days. After cruising the Caribbean we sailed north to Turks and Caicos and then to the Bahamas. Our first U.S. port of call was Biscayne Bay, Miami, Annie’s home-waters growing up. Then we headed north, stopping in places like St. Augustine and Charleston. On the July 4 weekend, we sailed past the Statue of Liberty and from there, up through New England to Maine. In September we headed south again, and in November we joined the Salty Dawg Rally, which brought us to the BVI and USVI. We are currently in Antigua. We’ve met so many wonderful like-minded sailors through cruising. It’s amazing how friendly, helpful and kind everyone is. That said, the realities of cruising are never the same as the expectations. In our case, it has been everything we could have dreamed of and more. But people should realize that there is a tremendous amount of work involved that must be done right and done safely. Preparation and maintenance are key. Learning from any available sources and, if cruising as a couple, figuring out what works for you and your partner is also paramount. Having good systems, especially for weather information and navigation, is priceless if you want to go offshore and feel safe. We use PredictWind with IridiumGo! so we can do weather routing and predictions using four weather models. For charts, we use Navionics on our B&G chartplotters plus an iPad as a backup. Our third backup is our iPhone, and we have solar chargers in case we lose power. As for other advice, it’s important to share the duties using each other’s strengths to make things work well. These days women are much more empowered than in the past. So, if she’s better at fixing things, let the woman be the engineer and the man be top chef! It doesn’t matter as long as you like what you do. We are originally from Houston, Texas. I am 33 and Graham is 34. Our third crewmember is, Friday, our 6-year-old, 65lb German shorthaired pointer. 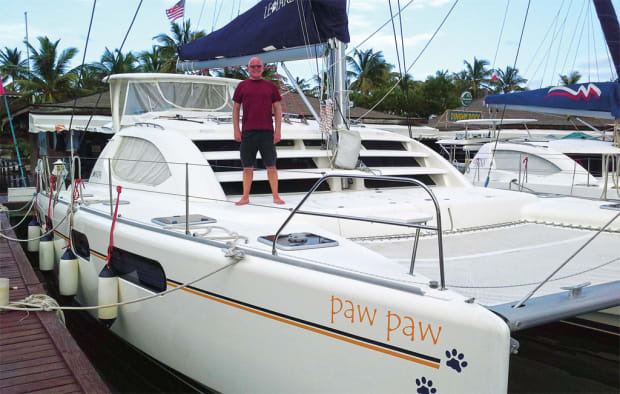 In July of 2015, we left our corporate jobs to pursue “Plan B.” Our original intention was to purchase a pre-owned Lagoon, but then we stepped aboard a Fountaine Pajot Helia 44 at the 2015 Annapolis Boat Show. The boat immediately felt like home. 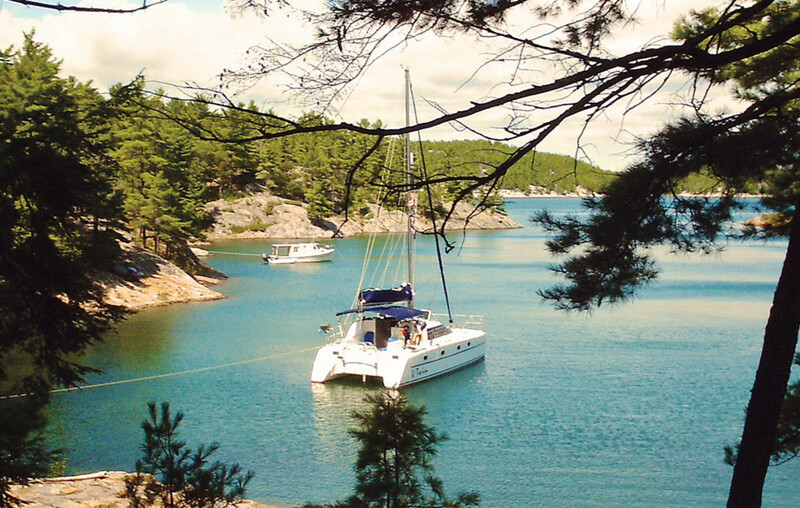 After a fruitless search for a used four-cabin Helia, we decided to take advantage of the favorable foreign exchange rate and put a deposit down on a new boat in December of 2015. In April of 2016, we flew to France (and shipped our remaining possessions) to pick up Allende from the factory and are proud to have sailed her every mile since. We left France in June and sailed through the Bay of Biscay and the Strait of Gibraltar into the Mediterranean for the summer season. Once there we welcomed family, friends and friends of friends for eight weeks of cruising the Spanish Costa Brava and the Balearic Islands. 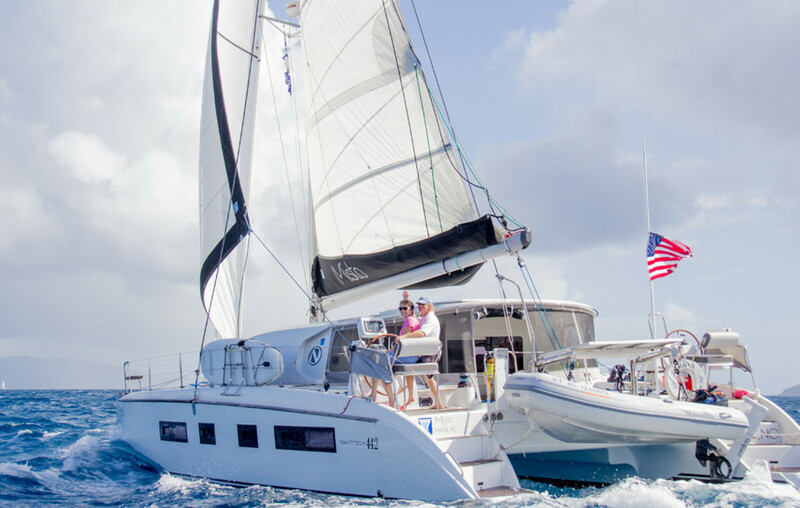 Then we crossed the Atlantic with the ARC+ and are currently based in Tortola, BVI, hosting guests aboard for fully-crewed charters. We plan to continue taking guests throughout the Caribbean for the next few years. We have three pieces of advice for aspiring cruisers. First, don’t discount any make or model of boat until you’ve seen it firsthand. Second, don’t be afraid to micromanage your boat purchase. We drove our broker and contractor crazy asking for detailed specifications, but because we didn’t back down we got exactly the boat we wanted at a reduced cost. Third, build a network of fellow sailors. In our case, other Helia owners shared valuable information as we prepared to meet our boat. Now we all share information about problems and solutions, saving everyone some trouble. We are a couple in our fifties. When we met more than 35 years ago, Roy told me that he wanted to sail around the world, and I thought he was out of his mind. So, that idea was put on hold while family, careers and college fees took priority. We did, however, own a Theta 26, Gallinule, while living in South Africa, which Roy raced and we used for weekend getaways. Fast-forward 15 years, and I asked Roy whether or not he still wanted to sail around the world. Next thing we knew, a plan was hatched. It took six years to come to fruition. Because Paw Paw, our Leopard 46, was to become our home and statistics indicated that most sailors spend 10 days at anchor for every one day at sea, we wanted as many of the comforts of home as possible. Certain key features of the Leopard 46, like the hardtop over the helm station and cockpit area, which provides more protection from the sun; the forward-facing nav station that allows us to control the yacht from the saloon; and the raised helm station, which provides better visibility when maneuvering while also allowing access from the cockpit area, helped convince us she was the boat we were looking for. Other features we liked were the boat’s easily accessible engines and easy access to the boom and mainsail via the aforementioned hardtop. Our plan is to visit the islands between Fiji and Australia in the next sailing season, then sail the east and northeast coast of Australia before heading north-northwest to Thailand via Indonesia, Singapore and Malaysia. Our advice for aspiring cruisers is to follow your dreams, but make it a reality by creating a detailed plan to sell up and go as soon as possible. Use whatever yacht you have, for whatever period you can afford. That might mean taking a sabbatical, putting your career on hold or retiring early while you are still physically able. Don’t postpone the dream if you have children. They will have an experience and education that far exceeds anything that can ever be taught in a classroom. Live your dream while the world generally still enjoys political stability, friendly nations and unspoiled destinations. Be realistic about the physical nature of the cruising lifestyle, as well as the work that’s inevitably involved, beyond the sailing aspects. Everything is a project, even simple activities, like doing the laundry or provisioning, but the rewards are priceless! Originally from the UK, but having lived in South Africa and Belgium before moving to the United States, we finally settled in Oriental, North Carolina, where there are more boats than residents! 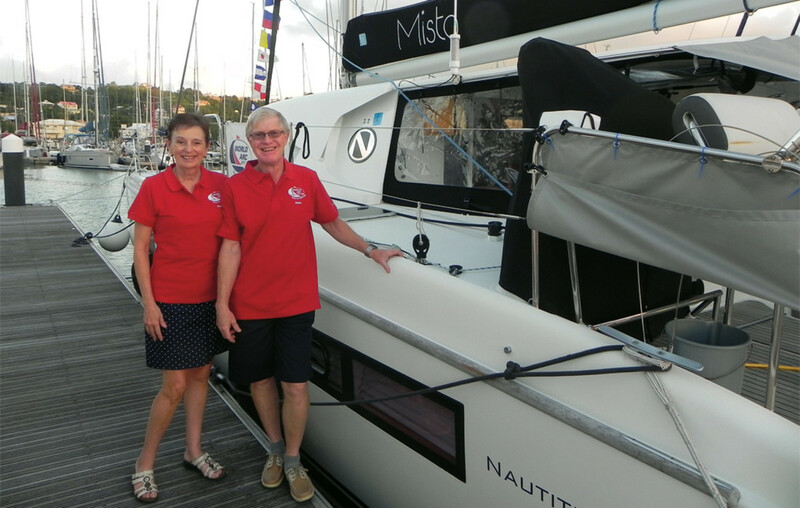 We took delivery of Misto in La Rochelle, France, and sailed as far as the Azores with the same delivery captain who completed the trip to Annapolis, Maryland. Misto is named after Mr. Mistoffeles, the magical cat from the musical Cats. We chose the Nautitech 442 for many reasons, first among them being performance, which, even without daggerboards, is very good. She also has a high bridgedeck clearance that minimizes wave slap, a low-profile coachroof and hulls with no raised helm station or flybridge, all in the interest of minimizing windage. 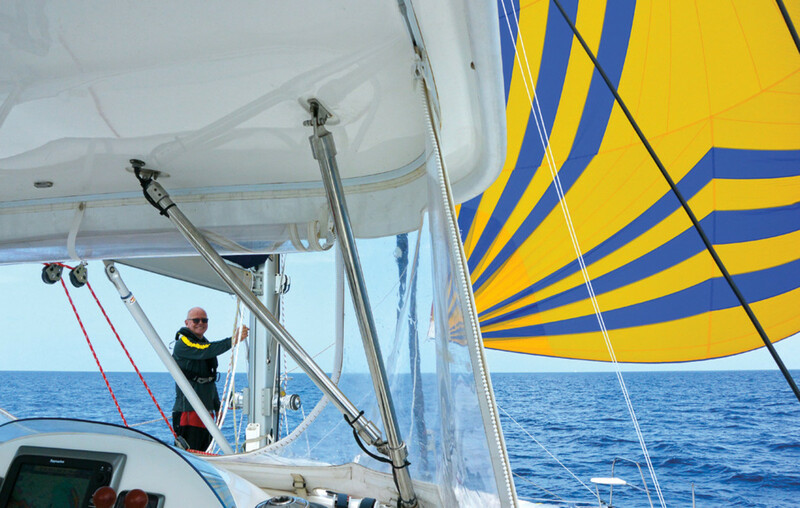 Having the boom close to the coachroof (as there is no raised helm station) also makes it easier to work on the mainsail, while the twin helm stations provide redundancy and make docking a snap. Since we bought her, we have made a number of additions and modifications, including installing an SSB radio, a Watt & Sea hydrogenerator, and a Hydrovane self-steering system. We also changed to a single-line reefing system for all three reefs and added a Parasailor. 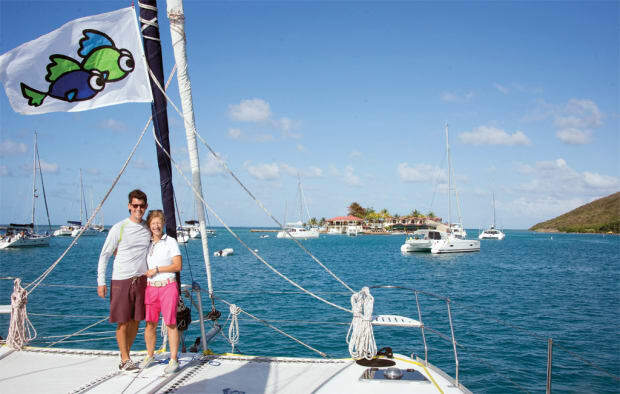 In November 2015 we took part in the Caribbean 1500 Rally from Portsmouth, Virginia, to Nanny Cay in the BVI and then returned to North Carolina by way of the Bahamas in April 2016—what we regarded as a “dry run” for what we planned to do next. Then, this past November we returned to the Caribbean, this time with the Salty Dawg Rally, sailing to Virgin Gorda, after which we joined the World ARC rally, which left St. Lucia in January. Looking ahead, our plans are to complete the first half of the World ARC through the Panama Canal, Galapagos, and down the Pacific Islands and then spend a year in New Zealand before re-joining the World ARC in Australia in 2018. Beyond that, we would like to spend some time with Misto in Europe. We started to research both monohulls and multihulls about five years ago. Obviously, there are some great cruising monohulls out there, and for a while, we were tempted by some of them. But as we continued researching multihulls we were struck by some of their key features, including speed, stability and safety (when sailed correctly), as well as the obvious advantage of space. In order to inform ourselves further, we spent two Annapolis Boat shows looking exclusively at multihulls. 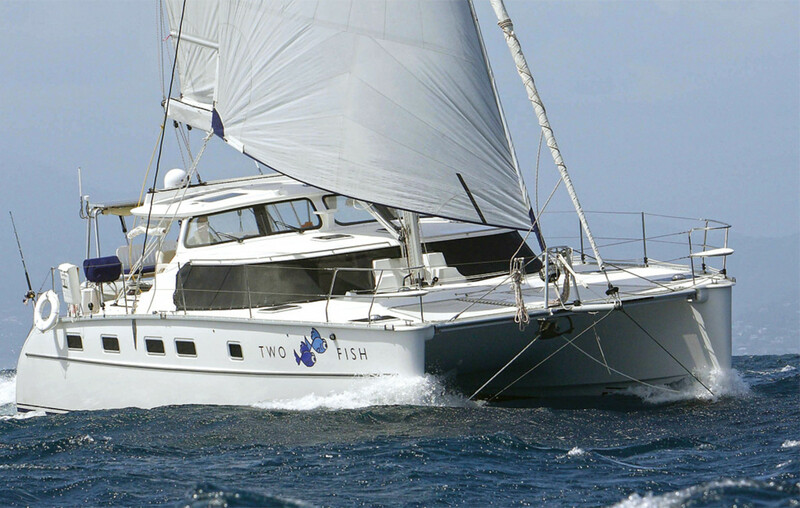 We also chartered a Leopard 44 in St. Vincent and the Grenadines. If we could give any advice to aspiring cruisers, it would be to decide what you are going to use the boat for—whether it’s coastal cruising or long-distance cruising—and then, based on your intended use, prioritize the features of each boat into three categories: must have, desirable, and not important or don’t mind. Trust us, you will amend this list as you gather more information. Be prepared to make changes and additions to your boat whether it is new or used. Get to know your boat’s systems and how to maintain them—courses like Mack Boring’s Yanmar diesel maintenance weekends are well worth the investment. If addition, if you have a big trip in mind, the World ARC for example, then plan some shorter “dry-run” trips to weed out problems. Our season in the Caribbean last year was very useful in identifying issues. Lastly, set a goal—and go! 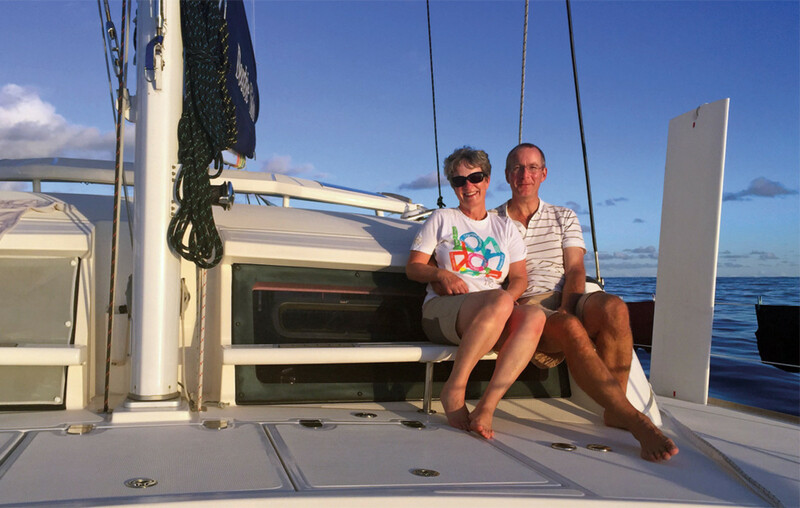 I am a retired retinal surgeon and sail Double Vision with Kate, who is a general practitioner. She is still working, but we have ambitions to sail the world over the next few years. 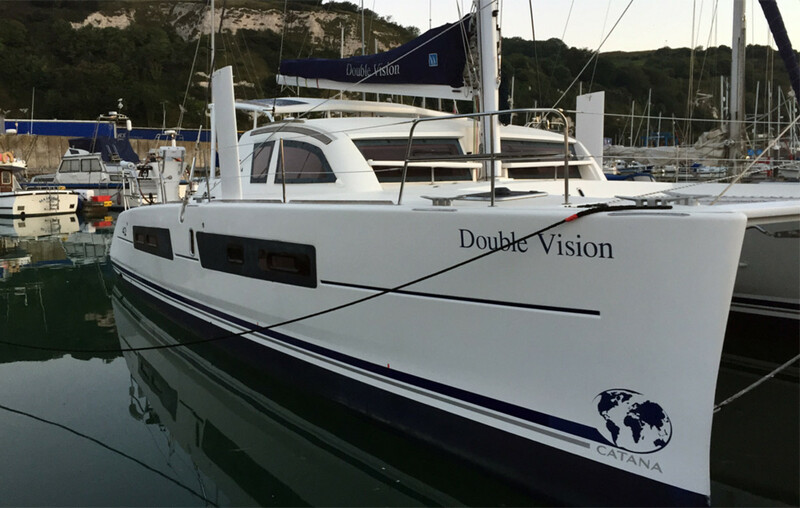 Double Vision is a Catana 42 built to our specifications in 2013 and collected from the factory in La Rochelle that same year. We chose her from a short list of 10 boats after eight years of research, multiple test sails and visits to the multihull show in Lorient in 2011 and 2012. We have just completed the ARC, and the boat will remain in the Caribbean for the season before we take her back to Europe. Our future plans are to participate in the ARC+ in 2018 and then continue westward to the Pacific. If I could say one thing to aspiring cruisers it would be this—if world cruising is your dream, then do it now! 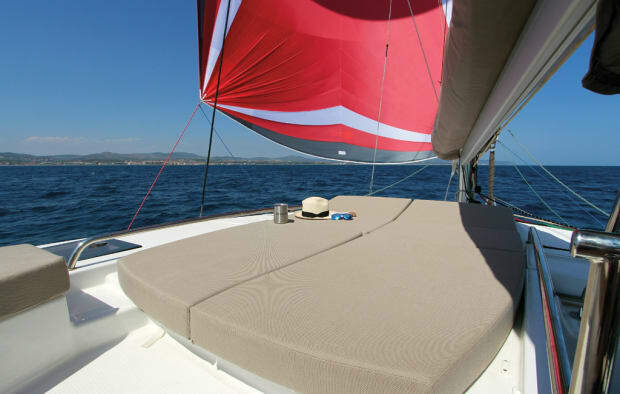 We chose an Antares 44 catamaran because we feel it is very comfortable at sea and anchor. She has a ton of space, which leads to more comfort. We find her easy to sail, because there is no need for whisker poles, the cockpit has ample room for sail changes, and the boat is easy to dock thanks to her twin engines. We found her at a boat show and waited a few years for our new boat to splash in Argentina in 2013. We spent our first year sailing up the South American coast from Buenos Aires. The next year we sailed up the East Coast of the United States to Maine and then back down to the Caribbean. In 2016 we made our Pacific crossing, and we plan on heading to the Bahamas in 2017. A lot of people ask us what our future plans are, but honestly we try not to have plans as we find they add too much stress. Our advice for aspiring cruisers is somewhat across the board, but that makes it no less important. First, learn to use Google Earth offline; it makes entering tough anchorages with coral reefs much easier. You’ll also want to practice docking until you’ve truly mastered it. People wonder if they shoud buy headsets? Buy headsets. And use them when docking or anchoring. Next, get really good at reefing, and also carry a dive tank. The latter will relieve you of the fear that can result from a stuck anchor or lines on the prop. Another pro-tip: take a class in diesel repair. Engines can be tough to figure out and a head-start will help a ton. Beyond that, don’t cruise without radar or AIS and be warned that you can never have too much solar power or freshwater. That said, cruising is much easier than many magazine articles and experts would have you believe. Do a couple of simple things well, and you should be just fine. Margi and I have lived aboard for 21 years (yes, in Detroit). We are both from Michigan and met through mutual scuba diving friends. Margi has taught numerous Power Squadron classes. She is a scuba instructor, and in her youth also worked in the Caribbean on boats for a year or so. While living in Florida, she rode a Harley and bought a Gemini 3000 catamaran, which she sailed up to Michigan in 1995. I am a US Coast Guard licensed captain who spent 13 years in marine retail, 11 years working for a large Detroit sail loft, and was once a professional trombone player. VTwin is hull #25 of 28 and was built for us in Palmetto, Florida, in 2001. She is a 35ft Victory 35 catamaran with a 16ft beam and 3ft 5in draft. She has two staterooms with oversized queen bunks, a separate step-in shower, a galley-up interior and slightly narrower beam, which fits us perfectly. Although the boat is only 35ft, the interior space feels much larger due to the design of the stepped hulls. Inscribed in the saloon sole onVTwin is “UBICUMQUE LOCORUM VENERIS IN EADEM ES NAVI”—no matter where we travel, we are in the same boat. She is powered by a 40hp Yanmar diesel engine. Upgrades include a hardtop, 32 amps of solar power from six solar panels, a 3kW generator, inverter, external Wi-Fi antenna, an SSB radio, LED lights, an Isotherm refrigerator/freezer and full Raymarine electronics, including radar. My work in marine retail has allowed us to make many improvements to the boat, keeping her up to date. In 1999 we took a year off to do the Great Loop on our first catamaran, a 1985 Gemini 3000. However, halfway through we were anchored in Boot Key Harbor, Marathon, Florida, when we saw a Victory 35 pull in. 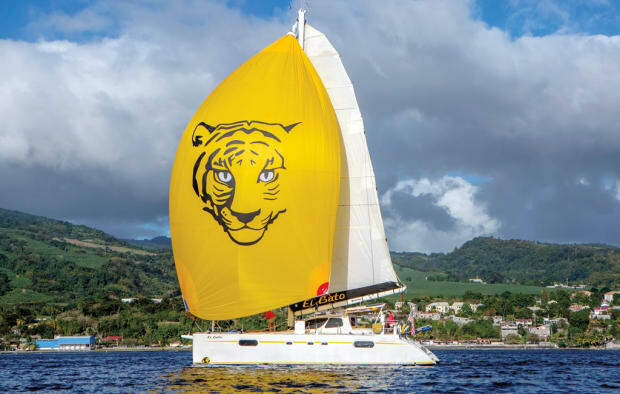 We always had a different, larger catamaran in mind for the future, but when we saw this one we fell in love immediately. Before we knew it, we had written a check for a down payment and were having one built. 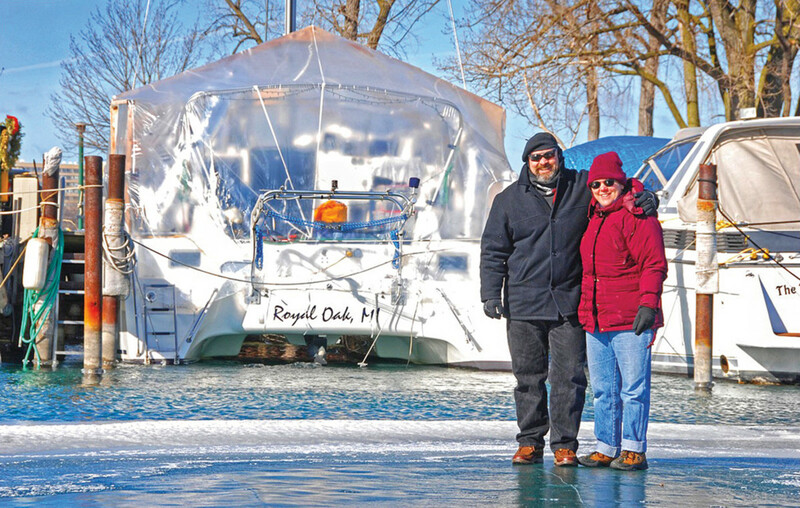 In July of 2001, after completing the Great Loop and returning to our jobs, the boat was trucked up to Michigan, after which we lived on her full-time at the Detroit Yacht Club until this past August when we became full-time cruisers again. We left the Great Lakes via the Welland and Erie Canals and cruised down the Eastern Seaboard to Florida. Currently, our plans are wide open. Maybe Cuba, maybe the Caribbean: our options are flexible as we’ve prepared the boat to go pretty much anywhere. 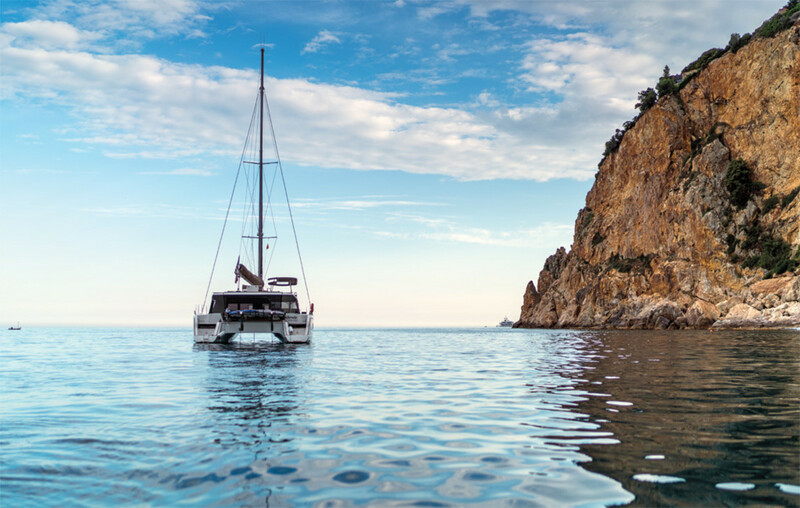 As far as advice for aspiring cruisers, we believe it is much better to live aboard your boat for some time before taking on extended cruising. This will help to determine what you truly need, what you don’t, and where it’s all going to go. Do as much of the work on your boat as you can, because this will allow you to learn how to fix and maintain it. Never forget that in the words of Captain Ron, “If anything’s going to happen, it’s going to happen out there.” Oh yeah, and watch Captain Ron! Beyond that, there is no such thing as a perfect boat, just the perfect boat for you. Finally, when you are out cruising and your friends want to visit, tell them either where you’ll meet them or when, but never both. Having schedules causes boaters to make decisions they shouldn’t.